I’ve been wanting to write about this garden for a long time, and have finally found the perfect opportunity with today’s Garden Designers Roundtable topic ‘Focusing on the Details’. While touring gardens last year with Debra Lee Baldwin, she insisted I meet her good friend, Jim Bishop. And, if I was really lucky, I might even get to see his garden. Thank heavens it was my lucky day. Jim Bishop is pretty amazing – he’s not only an incredibly talented garden designer, but he’s also the President of the San Diego Horticulture Society. The garden he’s created has been a labour of love for several years, and is one of those special places that you want to just spend an entire week exploring. It’s a fairly large garden, close to an acre, and reflects both his love of plants (succulents, in particular) but also his love of detail. In fact, it’s the detail that really makes this one-of-a-kind garden what it is. It’s true what they say – the devil’s in the details. As you approach Jim’s home, you enter through an unassuming doorway leading to an intimate and private courtyard. But even before you walk through the door, from the little details on the walls (the tiles, pots and plants in complementary colors) you know this is gonna be good! Oh, it’s more than good. While most courtyards are charming enough, it’s the details in this courtyard that make you say a silent prayer that he has all afternoon free so you can take your time absorbing everything. Color reins supreme in this courtyard, from the bright persimmon and lime green pillows to the cooling blues that run throughout. In fact, it’s the blues that really seem to be a uniting thread woven throughout the garden. And what courtyard would be complete without a little fun? Can’t you imagine these Tillandsia Mariachis double-billing with the Succulent People of San Diego Botanical Garden? But it doesn’t end at the courtyard -there’s more! Jim’s back garden consists of a series of terraces to help cope with a fairly steep slope. Slopes are something that are daunting to a lot of gardeners, but Jim’s solution of having two large patio areas combined with traversing paths throughout not only make it easy to roam, but enjoyable as well. Again, it’s Jim’s attention to details that make even the farthest reaches of this property full of surprises. Spanning two of the levels is one of the most charming little garden buildings I think I’ve seen. As you enter, you take the narrow, winding stairs down to the lower level with little windows allowing you to peek through to the garden below. But again, its the details like the vine trained over the tiled archway, the cluster of potted plants at the base of the stairs, even the weathervane that take this building from an ‘A’ to an ‘A+’. That’s what details do for a garden. At the base of this structure is an open air room, complete with everything a garden room should have – lots of comfy seating and pillows, a warm fire and plenty of views into the garden. But again, notice how the color blue makes its way from the courtyard in the front all the way down into this room. An important detail that should it not be included might result in a colorful, but slightly chaotic space. There are two exits from this room, each leading in opposite directions into the garden. But it’s the color blue again that entices the viewer along, beckoning them away from the comfy seating. Depending on which exit you take into the garden, you’ll find a series of winding steps that lead you around the perimeter and through the garden. As anyone knows who gardens on a slope, it’s not the easiest thing to create a manicured, tidy garden since maintaining it is a nightmare. So Jim’s solution is to let the plants spread and roam as they please. But to keep things interesting, he’s included lots of detail along the way…. Through the pathways Jim has clearly had fun finding places for his blue bottles, blending them with the stones to create colorful retaining walls. In addition, he’s taken this opportunity to place the treasures he’s found while remodeling his historic home in discreet spots along the way. It’s always such a surprise to round the corner and find an antique tile or sculptural sconce. Again, it’s all about the details. After walking back up the steep stairs, you’ll find yourself on the next patio – a perfect place to catch your breath and take in the view. Thank you, Jim and Debra! And thank you for your long conversations that day, allowing me plenty of time to quietly sneak away without seeming rude so I could lose myself in this treasure of a garden. Please make sure you stop by the other participating members of the Roundtable today to read their thoughts on ‘Focusing on Details’! What a great garden for hours of exploration. I bet you wished you had more time to see everything. Those are the best gardens — the ones you can come back to over and over and still see new details. Truly beautiful! Thanks for your very informative talk today at Succulent Gardens Extravaganza 2012. We are excited about incorporating some of your ideas into our garden. Thanks so much, Rikob! I’m so glad you enjoyed my talk today and hope some of my ideas really help you take your garden to the next level. Let me know how it goes! Thank you for a tour I could do with my feet up. They’ll need to be rested wtih all the work you’ve inspired! Ah yes, tours with feet up are nice sometimes, aren’t they? I’m glad you enjoyed this one Lydia. Thanks for stopping by! Thank you for the wonderful tour. That garden looks freakin’ amazing! Ha – freaking amazing,it is Mary! Oh my Rebbeca- there is enough topic material in that garden for five posts!!!! Fantastic job. I could spend days there. Thank you! Thank you so much for showing this inspirational garden! It is truly beautiful! I hope the Hort society includes this garden in a tour. It was be a marvelous Sunday garden tour! Wonderful post Rebecca, thank you so much for sharing your photos and your time in Jim’s garden. What a dream home and garden for a succulent lover like myself. I love how he pulled you around his beautiful retreat with the color blue. I have always loved that combination with succulents. Candy – you would have looooved this garden! If ever there was a succulent garden for you to see, this would be it – filled with skillfull combination of containers and succulents,filled with whimsy and filled with love. You’ve done a wonderful job of capturing one of my favorite gardens. Every time I’ve been fortunate enough to visit I marvel at Jim’s ingenuity and creativity. Such a complex garden, but the blue does tie it all together, as does the use of so many plants – succulents – with a similar essence in a multitude of forms and colors. 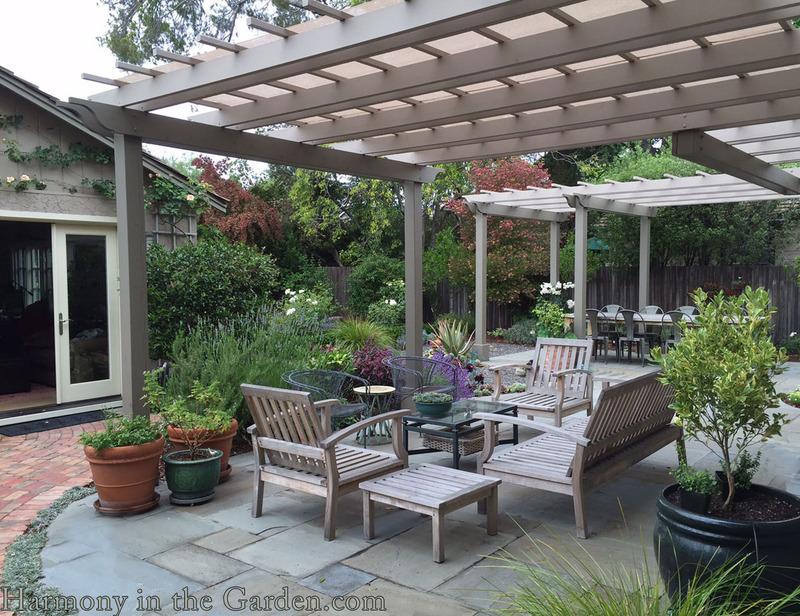 Susi – lucky you to have seen this garden more than once! I can only imagine it gets better and better over time, not only with Jim’s additions but with new things revealed with each new visit. Seriously??? Wow!!! I am in awe. What an absolutely gorgeous piece of art. Thank you for sharing. You’re so welcome, Lisa! Believe me, I was in awe as well. Thanks for sharing Rebecca. This is so amazing. You take great photos. What was with my hair that day? (Notice how I focus on what’s really important.) I love how Jim integrates succulents with other plants, how he creates unity with the color blue, how he’s overcome the challenges of a steep lot (with the help of partner Scott Borden) and how they beautifully remodeled one of San Diego’s Spanish colonial architectural treasures. Great shots, Rebecca—definitely a post to share. Rebecca, Wow, what an amazing garden, thanks for the tour. I love the unusual way Jim uses everyday items. Are those little hanging succulents in a rain chain? The use of tile work really adds to the feel of the garden. Is the tile around the door leading out to the garden recessed? Hi Debbie, yes those are little succulents tucked into the rain chain – aren’t they cute? You can tell we don’t get much rain down here, or they’d be long washed away – ha! And yes, the blue tile above the courtyard door is recessed. Not a surprise that you would notice this beautiful detail! What a fabulous garden! Thanks for showing us all the details. I absolutely love those blue bottles combined with the stones. Hi Alison – I loved those blue bottles, too! He had them interspersed throughout the garden, with clusters here and there and they were always such a lovely surprise to stumble upon. So gorgeous near the blue-grey agaves, too. I am totally impressed with his use of succulents. It is a big departure from the colorful perennial garden look. I am limited in regard to the succulents I can use in my zone but I am definitely going to be using more because of how hot our summers have become. I agree, Eileen – it’s a wonderful departure. And in our mild climate, it’s year-round as well – a huge bonus! There’s many cold-hardy succulents that you might be able to grow in your zone – you might refer to one of my favorite succulent books “Hardy Succulents” by Gwen Moore Kelaidis, and photographed by Saxon Holt. Not only is this book gorgeous, but it’s filled with tough plants for almost every zone. What a collection of succulents! I keep buying succulents and thanks to Debra’s books I learned how to use them together. That garden is a labor of love for sure. Aren’t Debra’s books fantastic, Laura? I refer to them over and over again, myself, and because of her I now look at containers and succulents in a whole new light. So glad you enjoyed the tour!